Mahathir - Anwar vs Najib - Zahid Dalam Mengawal Hutang Negara! 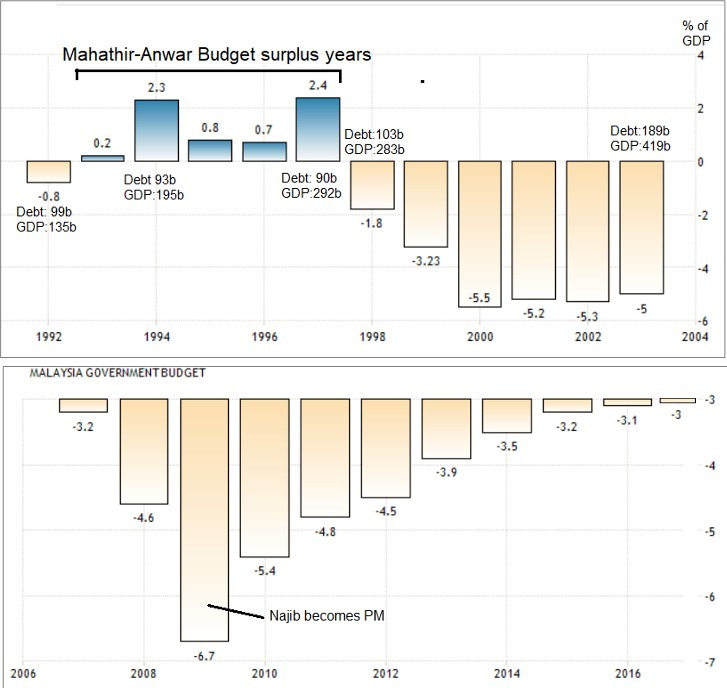 It is true that Mahathir and Anwar ran five years of budget surpluses in the early early 1990s on the back of super-normal economic growth in Malaysia and the region. This happened as the Japanese had to move their factories out of their country and invested in several countries in ASEAN which were considered low-cost. The Japanese had no choice then as they had succumbed to pressure from the USA and the western world to appreciate their currency, which more than doubled after the Plaza Accord was signed in late 1985 - causing their exports to be uncompetitive. Although the surpluses during were relatively modest at only +0.2%, +2.4%, +0.8%, +0.7% and +2.4% for the years 1992 to 1997, it had managed to reduce our govt debt from RM99 billion in 1991 to RM90 billion in 1997. (The numbers may seem small then but it is high compared to our total GDP of only RM135 billion in 1991. As a comparison, our GDP for 2017 is expected to be RM1.3 trillion - or ten times larger). By 1997, our Debt to GDP ratio had reduced to 31.9% compared to 73.3% in 1991. However, all these gains were wiped out in 1998 as the debt jumped back to RM103 billion. 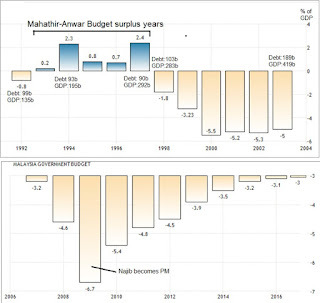 In the last 6 years of Mahathir as PM, we ran large budget deficits of mostly negative 5% - as a result, our Govt debt doubled to RM188 billion (45.1% debt-to-GDP) in 2003 when Mahathir retired compared to RM89 billion (31.9%) in 1997. Mahathir essentially ended his Prime Minister-ship the same was as he had started it by doubling the national debt within 6 years. Mahathir became PM in 1981 and within 6 years, he more than tripled our national debt from RM23 billion in 1980 (44% debt to GDP) to RM74 billion in 1986 (103.4% debt to GDP). PM Najib however increased the govt debt quickly when he became PM in 2009 to 50.8% from 39.8% Debt to GDP in 2008 - but this is due to the big stimulus packages that essentially saved Malaysia from the Great Global Recession, the worst since the 1930s depression, where the USA govt had to bail out AIA, General Motors, Citibank etc.. However, since then Najib has successfully reduced the big budget deficit of -6.7% in 2009 every single year until it now 3%, the lowest in 20 years - which resulted in our debt-to-GDP ratio dropping back to 50.7% (Q3 2017) now. This year, our budget deficit is forecast to reduce further to 2.8% on the back of strong economic growth. The above are facts which the Pakatan people do not tell you about. As history has shown, Mahathir is the least qualified person to talk about reducing our national debt. The fact is, our debt right now at 50.7% is at a comfortable level right now given the size of our economy - and certainly not considered high compared to the Mahathir years where it had even reached more than 103% and stayed above 90% for an extended period of time. Pemimpin DAP Akui Akan Kuasai Perak? PKR Sendiri Akui Mahathir Bapa Bailout Negara? Mahathir Tuduh Dirinya Perdana Menteri Korup? Rafizi Tuduh Anak Mahathir Jadi Taukeh Arak? Mahathir Kena Sound Tepek Dengan PAS? PM Sementara - PPBM Pun Sementara Juga! 27 Kerusi PAN Semuanya Mereka Tak Boleh Menang! Mahathir Marah Selepas Lihat Video Minyak Ini? Habislah Ringgit Dah Tak Laku Di Luar Negara? Agenda Rahsia DAP Di Sebalik Pencalonan Tun M? DAP Masih Ketua - Mahathir Umpan Sahaja! Harga Barang Keperluan Asas Naik Mendadak? Video Lagu Tun Tak Tau Viral Sampai Filipina? Apabila 'Awang Hitam' Lanyak Dua Gadis Melayu!